Manstein's assault on the Southern Sector of the Kursk Salient was spearheaded by Hoth's 4th Panzer Corps. Army Detachment Kempf was ordered to protect the eastern flank of the attacking force. The units that Kempf had at his disposal were formidable - III Panzer Corps, XI Army Corps and XLII Army Corps. A total of three panzer and six infantry divisions. Having arrived at Belgorod by train, we decided to follow the route Kempf took during the period 5th to 17th July 1943. This took us on country roads running parallel to the main line of attack by the SS Panzer Corps - operating a few miles to the west. This leg would take us to the village of Belenikhino a couple of miles south of Prokhorovka and would offer up some fascinating battlefield walks. During the first five days of the battle, the tanks of Army Detachment Kempf made relatively good progress across wide, flat terrain however from the outset the extraordinary defence of the Soviet 70th Army was such that valuable German assets were required to hold the right flank as the lead echelons advanced. This continual need to protect the flank left the attacking spearhead with less firepower than had originally been envisaged. As we passed to numerous memorials and roadside graves in the area it became apparent that the axis of the main road network has changed significantly since 1943. The first picture above shows the Druzhnyy to Gostishchevo road running west-east and the second shows a Soviet battlefield monument at the point where that road was bisected by Kempf's advancing force travelling in the south-north direction (as per the modern road). What a story this memorial and the nearby military cemeteries tell - authentic and informative! - two characteristics that the new crop of monuments at Prokhorovka lack. The memorial above sits in the village of Gostischevo itself. The figure is looking east across one of the many balkas which are a feature of the landscape in the area. Prior to the attack the Russians had proved adept at using civilian labour to augment these natural obstacles with additional ditches and earthworks. Kempf reached Sabynino and Gostischevo on the 10th July and almost immediately started to encounter the fresh infantry divisions of the Soviet 69th Army. Meanwhile to the west - the SS Panzer Corps were further forward - a misalignment which once again pulled much needed troops into the protection of their eastern flank. After a brief pause on the 10th July, Kempf launched the second stage of his northern thrust. The initial objectives were Rzhavets to the north east and Teterevino to the the north. We took the road to the latter and found a village full of military cemeteries and memorials. The picture below shows a memorial to local men - there are many common names. The furthest point of the advance was the railway junction at Belenikhino. 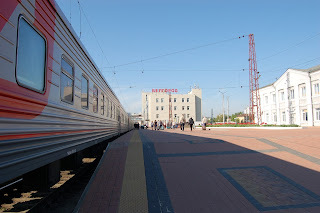 The south-north railway from Belgorod to Kursk ran dead centre of the Kempf line of attack. The village is not the easiest of places to find and we resorted to local intelligence in order to discover the whereabouts of the 5th Guards Army memorial which we knew to be in the area. the picture below shows a farmer pointing the way with a footbridge over the railway behind him. At Belenikhino the advancing units of Army Detachment Kempf met up with men of the 2nd SS Panzer Division Liebstandarte who were seeking to secure their right flank as the 5th Guards Tank Army continued their decisive attacks from the 12th July onwards. The water tower at Belenikhino Station has been rebuilt and can be seen in the picture below. The memorial above is flanked by two huge rolls of honour (not shown). The wording reads 'Memorial to the 5th Tank Corps - 5th July to 3rd August 1943 - Defenders of the Village.' Again the old west-east road is shown by a paved pathway which, in this case, is part of the memorial. From Belenkihino it is just a few miles to Prokhorovka but the Soviet defences with the 5th Guards as the main component - had proved too strong. It is perhaps fitting that this third instalment relating to the southern attack at Kursk should end with a tribute to these brave soviet soldiers. Click here for the Psel Bridgehead, Battle of Kursk (July 1943) and here for the Tank Battle at Prokhorovka (12th July 1943). Click here for my collection of photos taken in the Prockorovka area in May 2016.